On one of our trips back home in the Adirondacks, my husband went garage saleing (I think he was bored) and he found this wonderful bounty of antique lamps from a lady who made lampshades (a woman after my own heart) and he bought the most victorian looking ones he could find. They are in my attic at the moment because I need time to make the shades! So maybe I shouldn't be advertising for lampshade repairs for a while! lol! 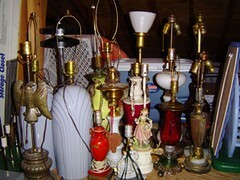 I'll post individual pictures of the lamps soon.